SACRAMENTO, Calif. (CN) – Rebuking a California Supreme Court ruling this week that paves the way for cities to pass new taxes more easily, Assembly Republicans Wednesday announced a constitutional amendment to require two-thirds voter approval of special tax hikes. Led by Assembly Republican Leader Chad Mayes of Yucca Valley, the lawmakers criticized the state high court for opening up “loopholes” for special interests to place and pass tax measures on local ballots. Mayes said special interest groups are lining up to take advantage of the court’s 5-2 decision that allows citizens to propose and pass special tax initiatives with a simple majority as opposed to the longstanding two-thirds majority requirement. 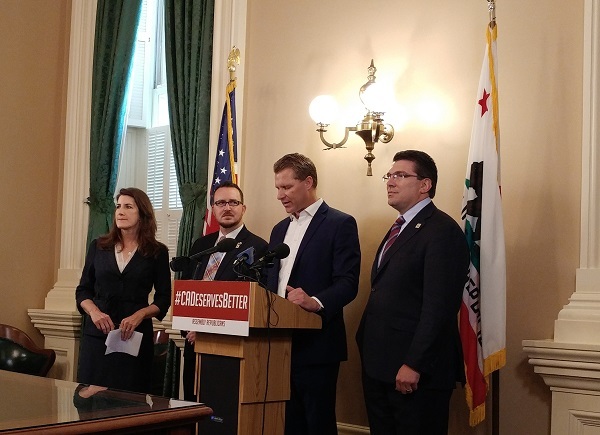 “If we don’t get this constitutional amendment passed, there will be a fire that will go all over California with local governments and local special interest groups trying to raise taxes on hard working Californians,” Mayes told reporters. Monday’s ruling roiled state Republicans and prompted a quick response. Their proposal, which hasn’t been finalized or released to the public, would reaffirm and cement language in a 1978 initiative that forces local governments to get two-thirds support for new taxes that fund specific projects like new schools or roads. Mayes says he hopes the measure will be on the June 2018 statewide ballot, but it will first need two-thirds approval in both state houses. Getting the measure before voters will be an uphill battle for Mayes as Democrats currently hold a supermajority in both the state Senate and Assembly. The state’s majority party meanwhile applauded the high court’s ruling. State Sen. Scott Wiener, D-San Francisco, said lowering the threshold for cities to pass special taxes will speed up critical local infrastructure projects. “It’s hard to overstate how important this ruling is. Communities will now have a much easier time funding schools, transportation and other critical needs,” Wiener said in a statement. Supporters of the Mayes’ amendment argue that lowering the threshold invites special interests to influence local elections and potentially collude with local governments. The interest groups could simply recruit residents to collect the required 15 percent of voters needed to qualify the initiative and then pass it via simple majority. Assemblyman Devon Mathis, R-Visalia, said meeting a supermajority threshold forces supporters of tax initiatives to reach out to the entire community and craft a well-rounded proposal. “Without having that threshold, there’s nothing to get both sides to sit down and come to that common ground and figure out that it’s done right,” Mathis said.